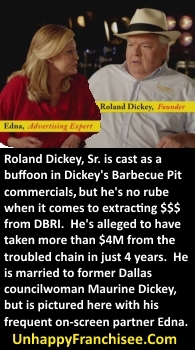 Dickey’s Barbecue Pit franchise owners may be closing their businesses and going bankrupt across the country, but that doesn’t mean the founder’s grandson Roland Dickey, Jr. and his family are suffering. According to an inside source who claims to have reviewed the DBRI corporate ledger, between 2010 and 2014, Roland Dickey, Jr. received over $5 million in the form of salary and “consulting fees” paid through family-owned corporations disguised to look like 3rd party vendors. The Dickey family may have extracted more than $15 million from the reportedly troubled franchise chain since 2011. 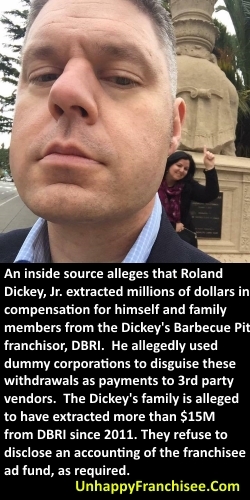 (UnhappyFranchisee.Com) According to an unnamed source (who allegedly has, or had, access to the company’s general ledger), Dickey’s Barbecue Restaurants Inc. has, in addition to reasonable compensation, paid more than $15.5 million to the Dickey’s family since 2011. [Question for Roland Dickey, Jr., Roland Dickey, Sr. and the Dickey’s family: Wouldn’t these millions be better spent with REAL vendors who could maybe help eliminate this problem and this problem? Our source claims that between 2010 – 2015, Roland Dickey, Jr. and Roland Dickey, Sr. used a number of corporate entities to disguise company payments to look like legitimate business expenses paid to 3rd party vendors when they were, in fact, simply pass through entities whose only purpose was to funnel money to the Roland Dickey family. Some of these entities may no longer be in existence. According to the Texas Secretary of State, numerous other entities owned by Roland Dickey, Jr. have been formed since then. Roland Dickey, Jr. is the grandson of founder Travis Dickey and the son of Roland Dickey, Sr. According to our insider source, Roland Dickey, Jr. received compensation of more than $5,000,000 from DBRI between the Fiscal Year ending (FYE) 2010 through FYE May 2014. This compensation was allegedly in the form of salary ($2.4M) and disguised payments through the pass-through entities listed above ($2.6M). This compensation does not include approximately $2M in Roland Jr.’s personal (non-business) expenses allegedly paid by DBRI during this period. It also does not include more than $300,000 for non-business travel, meals, clothing and home furnishings allegedly expensed by Roland’s wife, Laura Rea Dickey, and paid for by DBRI. Roland Dickey, Sr. is the son of founder Travis Dickey. He is the brother of TD Dickey, Jr., who passed away from pancreatic cancer in May, 2011. The two brothers operated the Dickey’s Barbecue Pit chain for many years as co-owners. It’s believed that the Roland Dickey, Sr. side of the family bought out the the shares of T.D. Dickey’s widow, Martha, in Spring or early Summer, 2016. According to our source, Roland Dickey, Sr. received compensation of more than $4.3M from DBRI between the Fiscal Year ending (FYE) 2010 through FYE May 2014. This chart does not include more than $1M in personal expenses allegedly paid by DBRI for this period. Roland Dickey, Sr. is married to Maurine Dickey. Cullen Dickey is the son of Roland Dickey, Sr. and the brother of Roland Dickey, Jr.. CONSULTING FEES (via 3rd party entities) ? ? ? ? ? ? ? About our information source: We believe the source of the information in this post is a credible inside source that has (or had at one time) access to the internal records and general ledger of DBRI for the relevant time period. However, it is possible that some or all of this information is flawed. We urge all interested parties to do their own investigation and let us know what they find. Also, we invite DBRI, Roland Dickey, Sr., Roland Dickey, Jr., Cullen Dickey, Martha Dickey or their representatives to provide corrections, clarifications, and/or rebuttals for any information they deem untrue or misstated. Anyone who would steal money from their own family, is not a person you should trust! Is there any hard evidence to provide the very lazy IRS or FBI? This would make the whole difference between accuse and get ready to prosecute. Anonymous I’m not sure if your posting on the wrong post or if you are comparing Dbri to 7/11 regardless it sounds all too familiar. Dbri also will do anything to create situations where you must buy their products or services. I think their whole intent is making everything a Dickey’s product so owners are completely reliant on them. Need online ordering? Use spark intel, even though it’s shotty at best and hardly works. Want proprietary products? Buy from wycliff owned by us. Even if it’s just slapping a label on a product made by someone else (IBP, farmland etc) want accounting? Well you have to use our company or we have to vet your accountant at your cost. Want insurance? You have to use our company or pay a fine. Once they have owners completely reliant then they have them trapped. Even if dbri goes under you still need their 3rd party services owned by them. Seems like a trap to me. I’m looking forward to the American Greed episode on the Dickey family. They don’t even bother to hide this stuff, everyone at corporate knows what’s going on. The $50M extraction from DBRI in 2016 to form Dickey’s Capital Group – that is totally separate from these payments to the individuals discussed above, right? Yes, I believe this is all referencing the time period prior to the Wells Fargo deal and the buyout of Martha Dickey’s shares. Dickey Family: Let them eat cake! We have caviar and champagne! Former employee here and I can vouch for a large part of this not being any surprise. This was the most awful company I was ever worked for, if a person made it past six months it was astounding. They set everyone up to fail and then wrote them up for failing. They lie to people about salaries & raises then run and hide when you try to call them on it. Biggest bunch of a-holes but still managed to attract some of the best talent, for a few months anyway, the smart ones bailed as soon as possible. Job seekers and people looking to invest your money in a business, RUN!!! It seems to me that if your own “CEO” thinks she’s only mildly qualified to hold the position that maybe you are doing all your franchisees a disservice by letting an inexperienced individual run the company. On the other hand, They’ve been doing that for years even when Roland Dickey Jr. was in that spot. Knowing that DBRI buys PR from “magazines” that will write anything they want, anyone know if QSR is one of those?